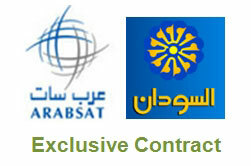 Arab Satellite Communications Organization, Arabsat, has signed today with the Sudanese TV a contract to broadcast the Sudanese TV channels bouquet exclusively on Arabsat satellites. Eng. Khalid bin Ahmed Balkheyour President & CEO of Arabsat, said that the ties between Arabsat and Sudan TV are strong and long-running, stressing that this signature is the culmination of a distinguished relationship between the Sudanese television with all its channels and Arabsat, he added “The Sudanese TV channels are exclusively broadcasted on Arabsat satellites including the exclusive broadcast of Sudan League on these channels, this trend makes Sudan one of the main pillars in the strategic orientations of Arabsat. Arabsat can secure all possible solutions for Telecommunications and television broadcasting services with full coverage of Sudan to ensure the independence and flexibility of its networks, with no need for any foreign satellite operators." Balkheyour also expressed his happiness for having the Sudanese TV channels on Arabsat wishing for those in charge all success, stressing that Arabsat will always be close to its customers to meet their requirements and provide all aspects of support to ensure their success in providing their Media message which will consequently keep Arabsat proactive in serving its customers and get them closer to their viewers round the globe.